We’re the go-to place for Halloween parties and we’ll make your bash scary good. NY Party Works has been in the party planning and rental business since 1993 and we know our way around Halloween. 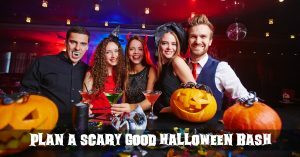 If you’re planning a big event or if you’re helping to organize a Halloween party for a company, school or organization, NY Party Works can help you plan the whole event with Total Event Planning. We’ll sit down with you and find out your goals and ideas for your party and we’ll also work with your budget. We’ll help with food, entertainment, and aesthetics to give your party the right look. A big part of your Halloween celebration revolves around the mood and feel of your party space. Very often you’ll want spooky, but for children’s parties, maybe not so spooky. Lighting and Special Effects are important. NY Party Works will create an atmosphere for you and light the party the way you want it. If you’re planning an outdoor event, we can provide you with tents from a small setup of 15×15 or 20×20 with round or rectangular tables and chairs all the way to large set ups. We can also set you up with great entertainment options including DJs, MCs and Dancers to give you exactly the music you want for your event. Learn about our cool Halloween entertainment options such as magicians and fortune tellers. Food is another staple of a Halloween party and NY Party Works can connect you with all types of catering services who can accommodate all types of events and all kind of different foods. We’ll also provide you with some popular items for your party. For example, what’s Halloween without candy? NY Party Works can allow your guests with a sweet tooth to access a variety of treats with our Candy Wall. We’ll also provide you with other fun food such as Glow in the Dark Cotton Candy , Hot Dogs and Popcorn. Halloween is all about costumes as well and we can supplement your costume planning with Face Painting and Body Art. We also can provide hair braiding, temporary tattoos including hand painted tattoos, glitter tattoos, air brushed tattoos, crystal tattoos and henna tattoos. NY Party Works will also offer the top party rentals including Inflatables, Arcade Games and Virtual Reality Games. Whatever you’re looking for to make your Halloween party the hit of 2017, we have it. All you have to do is ask. Contact NY Party Works today.